Figure 1 from page 4 of the paper: Country public financial management systems. See pages 6-7 of the paper for an annotated version of this figure. In recent years, the global community has come together to provide increasing levels of international finance to help developing nations adapt to the challenges presented by the threat of climate change. A number of funds to support adaptation initiatives in developing countries have been established. However, the mere availability of international funds isn’t enough for adaptation projects to translate into sustainable, climate-resilient development now and in the future. To make best use of the nance available, countries need to have the institutional capacity to prioritize their needs, access the funding and efficiently implement related projects. Strong country systems for managing public finance are widely considered to be critical to effective governance. The quality of these systems has a direct relationship to the ability of governments to successfully deliver services, including those related to climate change adaptation. However, a clear definition of the term “country systems” is an essential precursor to the discussion on ways to strengthen them. The context in which it is used has largely informed the way the term is understood. Nevertheless, understandings can and often do differ, thereby leading to confusion, miscommunication and the need to establish a common, practical definition. This paper, which is based on the experience of the USAID Adapt Asia-Pacific Project, presents one such practical definition to the term “country systems”. It then elaborates on the functionality of each of the eleven components of country systems (see below and Figure 1 above), drawing connections to climate change adaptation and related financing. This is the first publication in the USAID Adapt Asia-Pacific Adaptation Finance Knowledge Series. For related resources see the Further Resources section below. Preparation – the phase in which the strategic direction and national goals are determined and resource allocation priorities are established for the implementation of associated policies and projects. Typical components: Policy and Planning, Resource Allocation, Project Preparation, Approval. Implementation – the phase in which funds are expended and policies and projects are executed to achieve government goals. Typical components: Receipts and Disbursement, Procurement, Accounting. 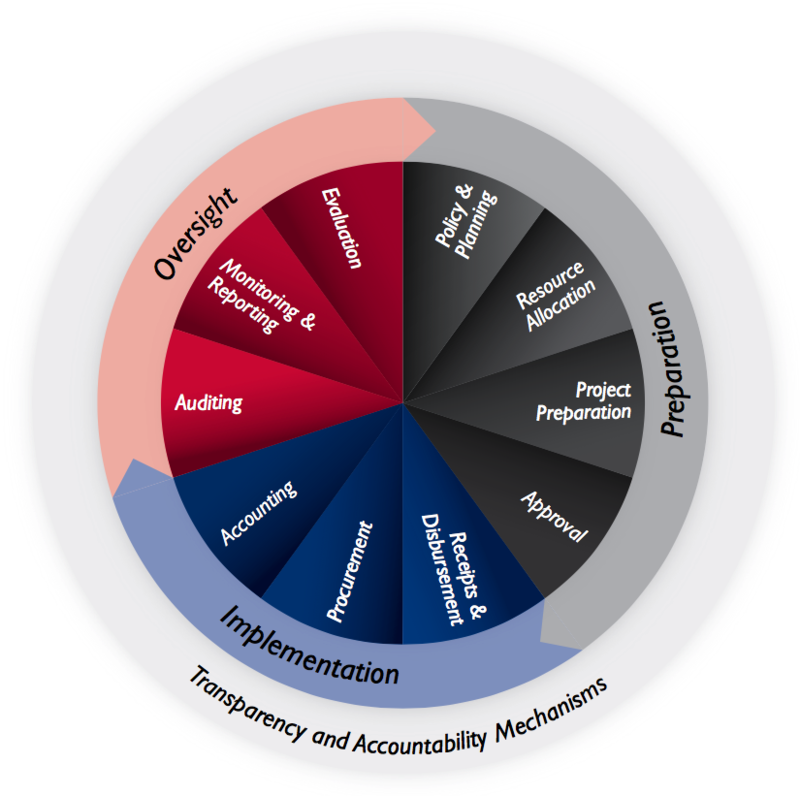 Oversight – the phase in which spending on policies and projects is reviewed and accounted for and progress towards achieving goals is evaluated. Typical components: Auditing, Monitoring and Reporting, Evaluation. Figure 2 on pages 6-7 of the paper provides a summary snapshot of these systems, identifying some of the common tangible elements within the systems and how adaptation plays out within them. Good public financial management is a necessary ingredient for a strong country response to the impacts of climate change over the medium- to long-term. That response will require that governments adopt a development approach that favors climate change adaptation, drawing upon an array of international, domestic and private sector financing sources and investing in climate-smart infrastructure, social services and sector strategies. For this response to be undertaken efficiently and transparently, countries need strong systems that help governments use available resources effectively. Strengthening country systems will help countries access international financing for adaptation. Access to adaptation funds will in turn ensure investments in building adaptive capacity, including institutional capacity, thereby further strengthening country systems. It is a mutually reinforcing process. To go about practically strengthening their systems for adaptation finance, it helps for countries to have a grounded and realistic understanding of how those systems are composed. This paper presents one such definition. It is presented to assist countries in understanding and identifying which parts of their own systems need strengthening. USAID Adapt Asia-Pacific (2015) Defining Country Systems for CCA Finance. USAID Regional Development Mission for Asia: Bangkok, Thailand. This policy brief examines the prospects for mobilizing private climate finance in Rwanda, focusing mainly on adaptation, and highlights measures that could stimulate investment. This report looks at emerging evidence of civil society engagement and identifies steps that providers of finance, governments, and CSOs can undertake to close the adaptation accountability gap. This briefing provides an overview of finance flows and major funds supporting adaptation in 2015 and the geographical distribution of these funds. How are dedicated climate funds progressing towards impact? This short update summarises results reported in 2015 by 14 funds which have collectively approved more than $8.7 billion for climate change projects in developing countries. This report, for the first time, analyses a decade of contributions and spending to nine major international and two national funds set-up to tackle climate change.